Furnished to a very high standard with excellent views of pool & sea. Sleeps 6. 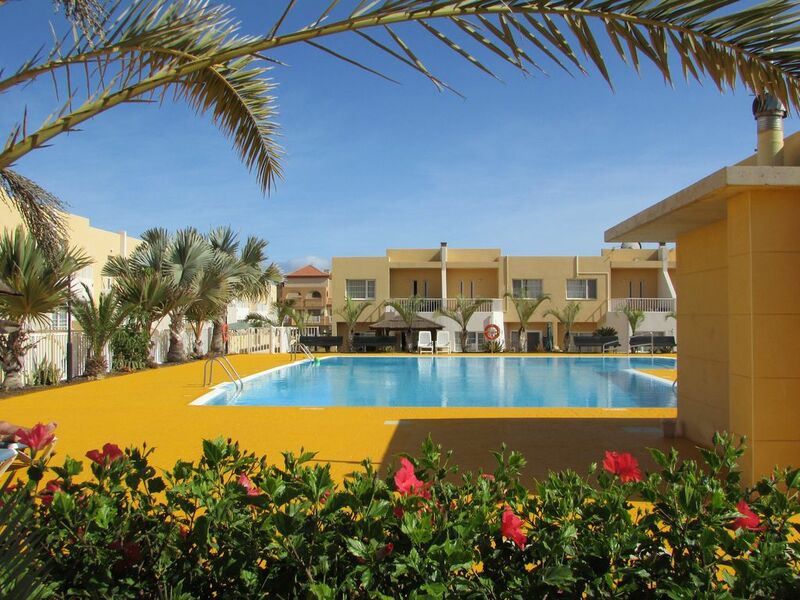 This townhouse in Caleta De Fuste Fuerteventura has FULL TOURISTIC LICENCE status and can sleep up to 6 people (including a baby in a travel cot). The house has 2 spacious living rooms with leather sofas and is furnished to a high standard. Private WI FI is now available at the house and we can purchase a data access code for you at a additional cost if required. 32" LCD English TV over 70 channels including bbc, itv, ch4, sports channels etc. DVD / CD player. A selection of DVDs / CDs are supplied as well as PS2 games console. The kitchen/breakfast room has seating for 5 people and is fully equipped. The dining area leads straight out onto your own private patio with lockable gate for child safety that overlooks the pool area and gardens. The 1st bedroom has double bed,fitted wardrobes and its own private balcony. The 2nd bedroom has twin beds, fitted wardrobes and its own private balcony with excellent pool / garden views as well as views of the sea . single put-u-up bed supplied for the 5th person and a travel cot for a baby / infant. FOR YOUR ADDITIONAL SECURITY : Doors and windows including bedroom balcony doors have been fitted with child proof locks for your safety. Balcony doors can be left ajar although remaining locked from the inside. Also supplied are hair-dryers, iron & ironing board, high chair and travel cot. There is a large fully fitted bathroom and shower as well as a separate WC on the ground floor. All bedding, towels and linen are provided as well as a digital safe for your valuables. Fuerteventura's Golf course is situated in Caleta de Fuste just a 5 minute drive away from our property. The course is an 18 hole, par 70 of 6049m from the men's championship tees, with 2 loops of nine holes starting and finishing at the clubhouse. There are three large lakes connected by a stream, all of which come into play. The course is flat with the exception of the 17th and 18th holes. The 17th, a par 5, gently climbs to a well protected green and the 18th, a par 4 is downhill that returns to the clubhouse with buggy paths connect all holes. The practice facilities include a 50 bay driving range, large putting green and a second green for chipping and bunker shots. The clubhouse includes a large pro-shop, changing rooms with lockers and storage area. There are various bars, cafeterias and restaurants as well as outside terrace and garden area. There are another four golf courses being planned - Pajara, Jandia, Cotillo and Puerto del Rosario. The nearest airport is Fuerteventura airport at Puerto del Rosario. The driving time from the airport to the resort is approx 10-15 min. Car hire is not essential as all amenities are within an easy walk from the complex. A taxi ride from the airport for 4 people is approx 12-15 euros and you are also able to catch a bus for around 2 euros. The nearest town to Caleta is Puerto del Rosario which is a 15 min drive. There is a large shopping centre (La Rotundas) and many shops. Puerto del Rosario is the capital of Fuerteventura. Corralejo to the north is approx 30 min drive. This is the main ferry port where you can take the 1/2 hour ferry to Lanzarote. The sand dunes of the natural park and beaches here are a must see with kite-boarding and surfing the main activities. Jandia in the south has the most beautiful beaches on the island. Caleta de Fuste has an array of restaurants. Every taste and budget is catered for.There is everything from traditional English food to Indian and Chinese. The main high street has many shops including gift shops, designer clothes shops, perfume as well as a 24 hour English doctors and many supermarkets. A 5 minute drive or just a short walk down the beach along the new promenade you can find the Atlantico shopping centre opposite Fuerteventura's PGA Golf Course. This large air – conditioned centre has designer clothes shops, supermarket and restaurants, amusement arcade, cinema and bowling alleys. A short walk from the centre and you are back on the beach. Here you will find some beautiful new bathing areas made around new lagoons as well as the bar El Chiringuito at the end of the pier. Caleta's own beach, the horseshoe bay, offers a large harbour and marina with every kind of water sport from Jetski's to submarine trips. There is also a dive school and Oceanarium at the harbour, as well as Harvey the local seal that puts on free performances for children. Around the beach area there are many other activities such as crazy golf, cycling, tennis and archery, volleyball, football and beauty spa. There are numerous other activities in Caleta including Horse riding, Quad biking and day trips for all the family. 70 U.K. channels including bbc, itv, ch4, all sky, sky sports, sky movies, Bt sport and lots more. Patio garden overlooking the pool area with table,chairs and parasols. Sun beds are also provided. The harbour and marina are approximately 15 minutes walk from the house. There are a selection of boat trips and water sport activities available. There are a full range of water sports available at the harbour. There are also two PADI dive schools and this is around a 10-15 minute walk from the house. Tennis courts are just a ten minute walk from the house towards the main horse-shoe beach along with archery, racquet ball and volley ball facilities. There are two golf courses around 1.5 miles from the house. You are able to use the free coach from the hotel adjacent to the complex to take you there. Journey time is around 10 - 15 minutes. Also provided, are a iron and ironing board, hair-dryer and safe for your valuables. WIFI is now available throughout the house and is provided for a extra cost. We can also provide a travel cot and high chair upon request free of Charge. For any late night arrivals a welcome pack can be provided with essentials: Tea, Coffee, water, bread etc..or anything else you require if we are notified in advance. The welcome pack service is charged as small additional extra. Caleta De Fuste is just a 15 minute drive from Fuerteventura Airport. The house is superbly situated; just 5 mins walk from the sandy beach, harbour and marina, tennis courts and spa. Also just 10 minute walk from the main centre with a huge variety of restaurants, bars and shops and a 5 mins drive from the Fuerteventura PGA Golf Course and 300 yards from one of the best fishing spots on the Island. The beautiful harbour area is the main holiday hub, offering boat trips and water sports including windsurfing, diving, jet-skiing, kiteboarding as well as dolphin, whale watching and deep-sea fishing. As well as the nearby 2 championship golf courses there is an array of shops and restaurants as well as cinema and bowling alley to keep you busy and the resort has a friendly family atmosphere.